Written by internationally known experts in the field, Stereotactic Radiosurgery and Stereotactic Body Radiation Therapy examines one of the fastest-developing subspecialties within radiation oncology. These procedures deliver large doses of radiation in one to five sessions to a precisely determined target. Often these techniques have proven to be as or more effective than traditional radiation therapy techniques, while at the same time being cost-efficient and convenient for the patient. These techniques, however, require careful planning, specialized equipment, and well-trained staff. This volume provides a cutting-edge look at the biological and technical underpinnings of SRS and SBRT techniques. It includes a history of the development of SRS and SBRT; clinical applications of the techniques; dedicated devices for delivering precisely shaped, high doses of radiation; use of in-room imaging for treatment planning and treatment guidance; immobilization techniques for accurate targeting; and future developments that will continue to evolve and refine existing techniques. A valuable introduction to those just learning about these specialized techniques, and an ideal reference for those who are already implementing them, this book covers a wide variety of topics, with clear discussions of each aspect of the technology employed. "… this book arrives at an opportune time for the student of and the expert in this form of radiation treatment. … a worthwhile and informative addition to this increasingly important branch of radiotherapy." 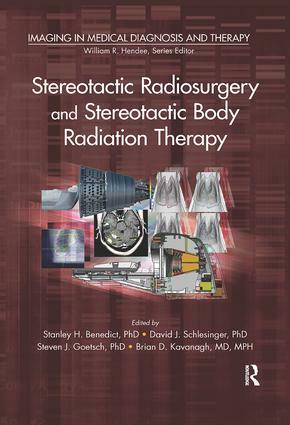 "In this text, the editors and authors have taken on a new strategy in their approach to covering the topic of stereotactic radiosurgery and stereotactic body radiotherapy … this book explores the historical developments of the Gamma Knife and linac-based SRS, the physics and radiobiology of SRS and SRT using photons and charged particles, dedicated SRS and SBRT devices, patient positioning and immobilization strategies, as well as a comprehensive clinical chapter on the various disease sites with relevant ongoing and completed protocols. This refreshing approach for assessing SRS and SBRT thereby allows the reader to explore well-referenced chapters on many individual aspects of the developing field. We trust the physicians, physicists, and other professionals involved in radiation oncology will find this book very valuable for their practice of SRS and SBRT."